The Coke Caps that were released in 1964, 1965, and 1966 are a really interesting area for Redskins football card collectors to get into. They are an item I have only started to appreciate and learn about. During these years Coke issued sets for each team, a set of NFL all-stars, a set of AFL all-stars, and set of all-stars from both leagues. The team sets are huge. The 1965 and 1966 Redskins team sets are 36 caps each. I cannot find a good checklist for the 1964 Redskins coke caps, but I have to assume there were 36 Redskins issued. Like the matchbooks, these caps all have a story. I look forward to putting together a complete set. 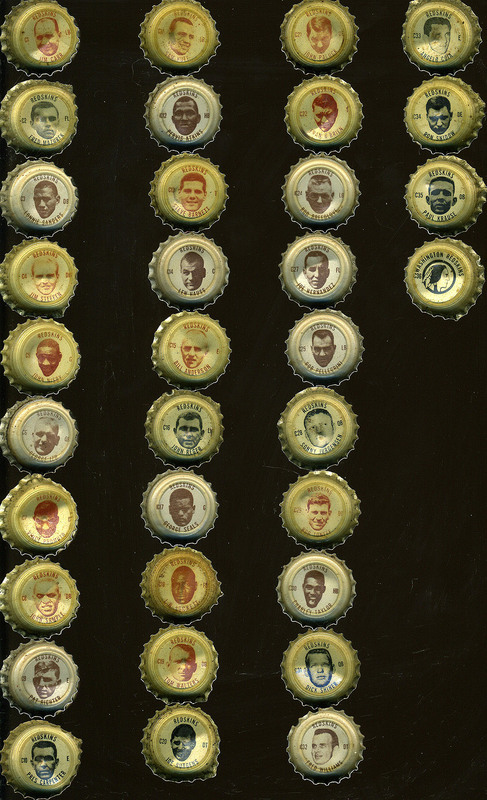 Below is near-complete set of 1965 caps. The first group is the Redskins team set. I am missing caps 23 and 26 from that set. Below the team set image is complete sets of the league all-stars and the national all-stars. The league all-stars are on the left and the national all-stars are on the right.